^ Pruszewicz, Marek (22 December 2014). 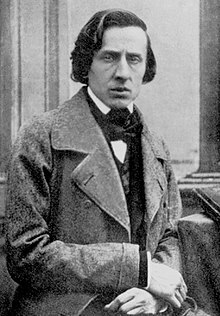 "The mystery of Chopin's death". Retrieved 31 January 2019. ^ Michael Church (13 May 1999). "An exile from the modern world". The Independent. Retrieved 3 May 2018. Leikin, Anatole (8 December 1994). "The sonatas". In Samson, Jim (ed.). The Cambridge Companion to Chopin. Cambridge Companions to Music. Cambridge University Press. ISBN 978-1-139-82499-6. This page was last edited on 25 April 2019, at 20:45 (UTC).